After 2 weeks away from the Maidens Head in Uckfield, we have come back with a fresh new look on the night… Saturday Night Sessions. 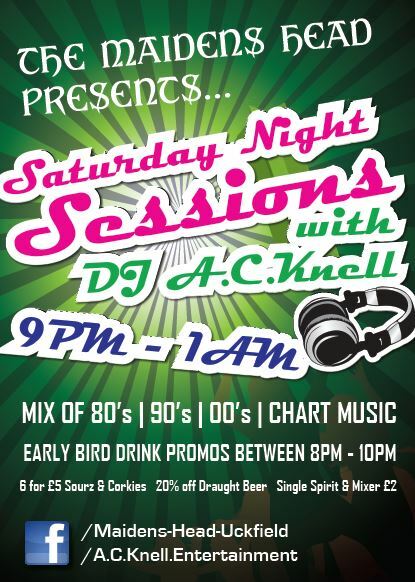 I will be spinning all the best tunes old and new, however the pub has some great early bird drink offers between 8PM – 10PM, so it is definitely worth popping down early! Look forward to seeing you at the launch evening tonight! A Happy New Year to you all. I hope you all had a fantastic Christmas break and hope the weather didn’t put a dampener on things (pardon the pun)! We have plenty of exciting developments for A.C.Knell Entertainment in 2014 and we would like for you to be a part of it. We have extended our Facebook followers offer and will still continue to offer 10% off all party bookings in 2014.